WASHINGTON — Arlis Jones found a herd of elk grazing on his mother’s grave. The fence he and the rest of the Shaddox Cemetery Association members installed to keep the animals out has led to an eight-year fight with the National Park Service over two-tenths of an acre of federal land within the fence. It’s a convoluted story of misconceptions, confusion and hurt feelings. And it’s at a standstill, with neither side speaking to the other in months. The Shaddox Cemetery lies off Arkansas 7 south of the ruins of the Dogpatch Theme Park, down a dirt and stone road that weaves through the trees and bushes that crowd the way. It is surrounded by land constituting the Buffalo National River. At a pavilion within the fence, Jones, his cousins and fellow cemetery association board members told their side of the story. The Shaddoxes have been in these hills since before the Civil War. The winding Mill Creek Trail below the cemetery takes visitors from Pruitt Landing, through fields once planted with corn, potatoes and pumpkins and past the Shaddox homestead that was rebuilt in the 1930s using the original 1870s wood cabin. The oldest of the 350 graves in the cemetery are those of brothers William Nelson and Jesse T. Atchley, who died the same day in an ambush in 1864. The Shaddox Cemetery is an “inholding,” one of the 16,243 parcels of private lands totaling more than 2.6 million acres within the boundaries of national parks and other protected areas, according to the National Park Service. Many of the privately owned parcels were mining claims, ranches and other properties that predated the parks and which owners declined to sell to the federal government. Of the 42 known cemeteries within the Buffalo National River, eight are privately owned, according to the National Park Service. All the private cemeteries are in Newton County, except for the New Arnold Cemetery in Searcy County. Many of the cemeteries don’t accept new burials, but Melvin Shaddox, 70, of Harrison said he expects the Shaddoxes to keep burying alongside their ancestors. The cemetery association has limited the plots to blood-kin, and small, homemade markers already designate the side-byside spots he and his wife have selected. Soon after Jones found the elk grazing among the tombstones, the cemetery association spent $12,000 — “not to mention a lot of blood, sweat and tears from sanding and painting” — to erect a steel fence, said Lois Willard, 63, of Marble Falls. Association members say they were told by a park ranger at the time to place the fence where it is on the federal land because the legal boundary runs down the center of two conjoined trees. They have no documentation to prove the conversation happened. Park Service officials say they told association members to put the fence on the boundary and get a permit for visitors to drive on the park’s land to reach the back of the cemetery. The Park Service says the association damaged an American Indian archaeological site dating between 700 and 50 B.C. when brush was cleared to build the fence in 2007. The cemetery association disputes how extensive the site is. Park Service workers installed a wire fence along the legal boundary — within the fence — in 2013 but took it down after the association accused them of driving over the grave of World War II veteran Guy Nelson Loomis along the border. Frustrations reached the point that the Park Service brought in a new deputy superintendent, Laura Miller, to act as a liaison between park superintendent Kevin Cheri and the members of the cemetery association. Soon Arkansas’ U.S. Sens. John Boozman, a Republican, and Mark Pryor, a Democrat, and U.S. Rep. Steve Womack, R-Ark., stepped in as mediators. The delegation and their staffs visited the cemetery, held public meetings and spoke frequently with the cemetery association for months. Emails between the Park Service and delegation obtained under the Freedom of Information Act show a flurry of talk about whether the service could resolve the dispute or if the delegation needed to file legislation. Also included was correspondence from the cemetery association that grew more distressed that the dispute hadn’t been resolved. Last summer Boozman’s office, with support from the other offices, began preparing legislation that would have forced the National Park Service to trade land with the Shaddox Cemetery after completing an environmental study. But before anything was filed, the cemetery association told the delegation it would prefer an administrative fix, citing concerns about the cost and possibility the legislation could be amended. The association proposed a land trade; the two-tenths of an acre of federal land inside the fence for forty-seven-one-hundredths of an acre of cemetery land that is on a steep hill outside the fence and unsuitable for burials. They say it’s a “minor boundary adjustment,” which the secretary of the Interior Department is allowed to do by law and has done for other landowners in the area. “This thing could have been done a long time ago with just a snap of your fingers, a few signatures and it’s over with,” Shaddox said. Sitting in the park superintendent’s office in Harrison, Cheri and Miller stressed that simply moving the fence to the current legal boundary would be the cheapest, easiest way to resolve the situation. Previous land swaps with landowners that the association points to aren’t comparable and involved different circumstances from the Shaddox Cemetery, Cheri said. Instead, the Park Service could agree to a “land exchange,” a process that requires an environmental study and could cost the cemetery association as much as $127,000, Cheri wrote in a December 2014 letter to the association. It’s up to the association to pay the costs of a transfer, Miller said. “We can’t very well expect all the other taxpayers of the U.S. to foot the bill for something that’s really a benefit only to a private organization, or a private party,” she said. Miller followed up on Cheri’s December letter to the association members in January asking them to inform the Park Service about how they planned to handle the situation within 90 days. That deadline passed in March without a response, she said. Shaddox said the group replied, but sent the letter to the congressional delegation, not to the National Park Service, by fax Feb. 3. He said the delegation told the association not to communicate with Cheri. “They said they were going to give us till March to make our decision, but March has passed and we still haven’t heard anything,” he said. Shaddox said the staff member he’s worked with in Boozman’s office hasn’t responded to the half-dozen emails he’s sent since. Boozman’s office employees say they haven’t heard from Shaddox since February. Boozman’s spokesman, Patrick Creamer, said that once the cemetery association chose an administrative solution rather than a congressional fix there was little left for the delegation to do. He said association members should be communicating directly with the National Park Service. 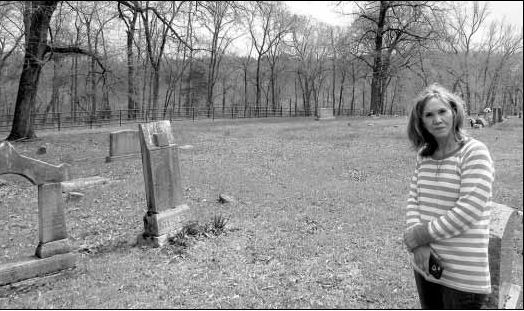 For generations, Ozark families buried their dead close by, said Abby Burnett, an independent cemetery researcher living near Kingston and author of Gone to the Grave: Burial Customs of the Arkansas Ozarks. She said there are an unknown number of graves within the federal land. “There were no rules about where you can and cannot bury, so a lot of people simply buried on their own land and then that would turn into cemeteries,” Burnett said. When the Buffalo National River was created in 1972, and private land was bought or condemned, there was a lot of bitterness, she said. It was one thing to lose a homestead. The Park Service aims to preserve land in its wildest state, and the forest has reclaimed fields and homes and graves. Many burial sites aren’t reachable by road; one cemetery is most easily reached by canoe. Acts of remembrance through decoration days — the practice of decorating graves that originated in 1868 to honor Civil War dead and eventually became Memorial Day — and visitation remain an important part of many family traditions, Burnett said. After talking with a reporter, Shaddox, Jones and Willard walked through the cemetery before leaving, picking up trash and checking whether flowers were fresh. They visit at least once a month and dozens of the graves are covered with flags, flower arrangements and knickknacks. “It’s our heritage,” Willard said. Shaddox said after eight years, the cemetery association wants the fence dispute settled one way or another. Heading into Memorial Day weekend, Shaddox said there has been no communication from the National Park Service in months. Cheri said it is unusual for a dispute with a private landowner to linger so long. In April, the Buffalo National River staff members said they hadn’t talked with regional and Washington officials about what to do next. “That’s probably the next conversation we need to have, because we do have a duty to protect the land and the taxpayers’ interest and the archaeological site,” Miller said. Reached shortly before the start of the Memorial Day weekend, Miller said nothing had changed.